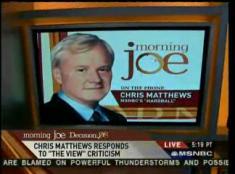 Chris Matthews has been taking a lot of heat over his vitriolic analysis of Hillary Clinton's political career during MSNBC's coverage of the NH primary. Is it possible that Hillary might have won her Senate seat without the scandal that Bill was involved in? Of course it is. He actually tries to say that his take was historical fact and not opinion. Huh? Here's Tweety on The Scar saying that he was taken out of context by the ladies of The View. "Those are this historic facts, Barbara and the other woman, those are the historic facts. I know how you play to a crowd, I know how talk radio works, which is the way a lot of programs work, where you find something to argue about," Matthews said. 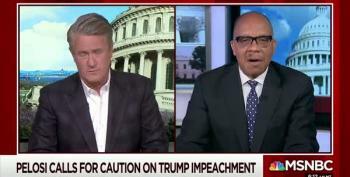 And if Barbara Walters wants to debate history and politics and what's happened in this country in the last 50 years, if she wants to go on Jeopardy! and see what she knows and what I know, I'll take her on. If any of the women on that show want to take me on on historic, political information, let's have a -- let's raise some money for charity; it'd be kind of an interesting way to do it. Let's talk political history, let's talk facts -- not opinion, facts -- and I'll take them on. Media Matters has a CM petition going: "It's time to play a little "hardball." Please contact MSNBC and Chris Matthews today and let them know what you think." Sign up if you have a chance. I know we're spending a lot of time on CM, but his behavior is indicative of the many villagers that populate the political discourse in our country. Digby nails it as usual. One of the things the village idiots like Matthews continuously fail to understand is that voters don't like the media trying to "take down" politicians on their own, against the will of the people. We inconvenient citizens don't have much in this system but the right to vote for our representatives --- when these elites decide all on their own that we've made the wrong choice (or that we're about to) we tend to get a little bit testy.